Interview with Amanda Tysowski, chatting about EVERYTHING INTUITIVE EATING: why eating intuitively works, how to eat keto without tracking, listening to your body, incorporating self care as a mom, and so much more. This week on The Keto Diet Podcast, we’re finishing up our two part series all about macros! 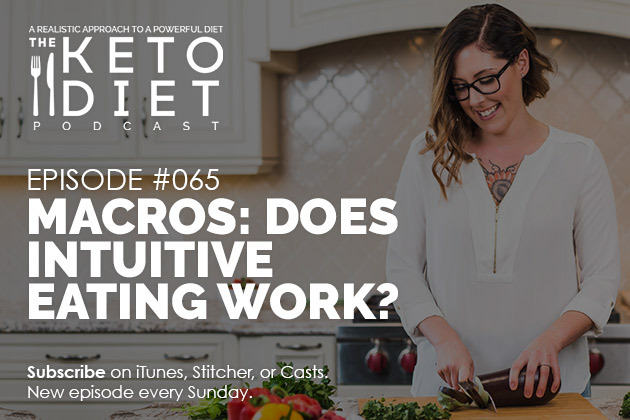 Part one of the series focused on macro tracking, and this week, part two focuses on intuitive eating. My version of keto hasn’t included tracking for some time because for me, tracking easily turns into restricting. For that reason, I tend to advocate for a more intuitive version of keto. I know this can make some people nervous, because without tracking, how will they know they’re doing the “right thing”? The truth is, there’s no right way to keto, and I’m hoping that’s what people will take away from this series. It’s never about doing what’s right, but what feels right for you. I think that’s what both of our guests tried to emphasize in this series. This week, I wanted to speak with someone who eats intuitively and enjoys it as a means of honoring themselves and their individual experience. In today’s podcast, I chat with our guest Amanda Tysowski, a wife and mom of two who went on a journey to become the best version of herself for her and lost over 100 pounds in the process, all while listening to her body and eating intuitively. This episode is all about the benefits of intuitive eating, how to listen to your body, eat intuitively, enjoy the process, and more. Slowly simmered bone broth delivered in glass bottles. Meaning you get to drink you broth on the go, from virtually anywhere! Save 10% on Broya Bone Broth with the coupon code, KETO10. 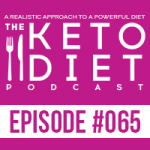 Leanne Vogel: You’re listening to Episode Number 65 of the Keto Diet podcast. Today we’re chatting about the process of not tracking your macros, how to eat intuitively, and where fasting fits into that, how to put yourself first as a mother, signs you need more protein and fat, and so much more. So, stay tuned. Hey, guys. Happy Sunday and Happy almost Christmas. If you’re celebrating, I hope you are enjoying today, which is Christmas Eve, and that you’re surrounded by people that you love, and you’re having a good time. The show notes and full transcript for today’s episode can be found at HealthfulPursuit.com/podcast/e65. The transcript is added to the post about three to five days following the initial air date of this episode. Let’s hear from one of our awesome partners. 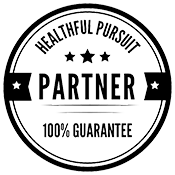 If you have an idea for a podcast episode or want to submit praise over and above your review, which you can leave by going to HealthfulPursuit.com/review, you can reach me at info@ketodietpodcast.com. No announcements today, so we can just jump right into chatting with our guest today, who is Amanda Tysowski. She’s a 30 year old wife and mom of two on a journey to become the best version of herself for her family. She began a ketogenic diet in January of 2017 with no expectations, just the hope of losing some weight. What she found in the process was herself. She is happier, healthier, living her best life, and has healed her relationship with food using keto. Amanda has lost 100 pounds without tracking macros on keto and has recently transitioned into tracking, as she has started training in the gym. Now, this is a two part series on macros. Last week, Episode 64, we chatted about why somebody would want to track macros and the benefits that the individual had seen by tracking their macros. This week, we’re chatting with somebody who doesn’t enjoy tracking, and who eats intuitively just so that you guys can see that there are so many different varieties of keto, and some people will thrive on one thing, and another person will thrive on another. As long as we’re just feeling good, and being truthful and honest with our body and our progress, we really can’t ask for anything more. So, if you are triggered by conversations of macros, tracking, and calories, you might just want to skip this episode. It’s very pro-intuitive eating, but if you just don’t even want to hear anything about macros, I would just skip it. Hey, Amanda. How’s it going? Amanda Tysowski: Hey, it’s going great. Leanne Vogel: Thanks so much for joining me today. Amanda Tysowski: Yeah, of course. I’m so excited to be here. Leanne Vogel: Amazing. So, for listeners that may not be familiar with you, why don’t you start off by telling us a little bit about who Amanda is? Amanda Tysowski: Sure. So, my name is Amanda. I’m a 30 year old mom. I stay home with my two kids who are three and one. And, I live in Winnipeg. It’s in Manitoba, right in the middle of Canada. Leanne Vogel: Which is an amazing province. I really like Manitoba. Kevin and I went there a couple of months ago, during the summer actually, and we were amazed at just how friendly people are in Manitoba. Amanda Tysowski: Yeah, we have it right on our license plates. Leanne Vogel: You do. I thought it was all a lie, but it’s not. Amanda Tysowski: No, it’s actually true. Yep. And, yeah, I was actually at your book signing. Leanne Vogel: Yeah, I had no idea. It took me a little while to put the two together, but thanks so much for coming to the signing. I remember Winnipeg. That was almost at the end of the tour and I was so tired. So, thank you for coming. Leanne Vogel: Okay, so. I want to chat a little bit about, first off, your keto experience and what that was like adapting, and how you found keto. Then, I want to get into the details of eating intuitively and whether or not you track your macros, and things like that. So, first off, how did you find the ketogenic diet? Amanda Tysowski: I kind of found keto by accident. Being a mom, I started reading labels and I wanted to cut out sugar. So, when I had my second child, after my first child actually, I had done great. I lost the weight. I was doing great. And, I gained a lot with my second child. I tried everything I could to lose weight the same way and it just wasn’t coming off and I knew I needed to change something. So, I started out on this journey to reduce sugar, and I went on to Instagram to follow some people who cut sugar, and look for recipes, inspiration, and whatever. I kind of came across keto and it just all kind of fell into place from there. What was your experience adapting, because you were saying you enjoyed sugar and you were trying to figure out how to remove it. So, was that experience of completely overhauling your diet a nightmare? Was it pretty easy? What did you find? Amanda Tysowski: You know, I am actually surprised at how easy it was. I think I was just mentally ready, which makes a big difference. But, yeah. We just started making substitutions like cauliflower rice for rice and just really cleaned up our food, stopped eating so much boxed food or takeout, and just started preparing our own food, and we actually found just having some chicken and vegetables for supper, we don’t miss having the pasta or the bread, or anything with it. So, it actually came quite easily and I really enjoy it. Leanne Vogel: That’s awesome and so good. I think when you’re meant to make a change, it’s a lot easier, because you’re driven and you just want to make that change, and it becomes a lot easier to adjust things, so that’s cool that that was your experience. How has keto changed things for you? Now that you’ve been eating Keto, what sort of changes have you noticed? Leanne Vogel: Yeah, I never know what month it is. Amanda Tysowski: It switches so quickly these days. Yeah, so the weight loss has been great, but my body feels better. It functions better, it doesn’t ache as much. I just feel better and more alert. When you feel like that, you really feel like you want to continue this, and it makes it worth it. When you see somebody having bread or pasta and you want it, but then you think “I don’t want to feel that way after,” and it just reassures you. Leanne Vogel: That’s awesome. That’s so good. What was your process when you started eating keto, I’m sure you learned about macros and what those were. Did you track immediately? Did you not track? What was your process with figuring out macros? Amanda Tysowski: You know, I didn’t. I kind of went into it with nobody to support me or no guidance, maybe is a better word for it. I didn’t really do any research for it. So, I didn’t really know about macros until a little bit … Maybe about a month into my journey. I took a look into them, and I thought “Oh, those are overwhelming, I’m doing good on my own,” and I just went with it. So, yeah. I just kind of went with it and it worked for me, so I just continue doing that. Leanne Vogel: Holy moly. Okay, back up the bus. I have so many questions, because it’s very rare to meet somebody that starts keto and is like “Eh, macros. Too much work, not doing it.” But, even when you found out about macros, you were also thinking too much work. What were you doing instead of counting macros? How did that work? Amanda Tysowski: You know, honestly, I don’t know how to answer that. I try to think back to January and I just changed my diet. I had a Bulletproof coffee in the morning. I had bacon and eggs. Then, I would make my husband … You know, we would have a cauliflower beef dish, because it was winter. So, a nice comforting food dish with cheese on it. And, we would just eat that, and we were both losing weight. So, we just went with it and it just worked out. Leanne Vogel: Yeah, I mean, there’s not a lot of science … Like, I get the same question all the time. Like, how could you not track? And, it’s sort of like, well, I know what things have carbs. I know what things don’t. I know what fat is. So, I just eat the things that don’t have a lot of carbs and pair it with a bunch of fat. It doesn’t have to be complicated. I think a lot of people make it more complicated. So, you’re saying more like you set the intention of eating low carb high fat, and then you just do that. You’ve been eating this way almost for a year. What has changed with macros, if anything, throughout your experience on keto so far? Amanda Tysowski: Last month, I started back at the gym, so October. And, I decided that because I hadn’t tracked and so many people ask me about tracking, that I would give it a shot. Kind of the I’m putting the work in the gym, so I’m going to put the work in the kitchen kind of mentality. So, I tried tracking. I didn’t lose any weight that month and I was very stressed out about it. So, this month I’m back to not tracking, but I do have to say though, I did learn a lot about protein, fats, and where it comes from in food. So, now that I’m back to eating intuitively, I kind of can make some better choices towards incorporating more protein for my workouts, but still not tracking. Leanne Vogel: That’s awesome. I find whenever I start being mindful of macros, I end up overeating or under-eating, or just becoming obsessive. It’s a very quick process for me. So, that’s really cool that you experienced a similar thing. Now, to get back to the intuitive eating on keto and what that’s like, you kind of talked a little bit of an example day of the foods that you eat. I’m wondering if you could go through a typical day of how you know … This might be a silly question, you might be like “I don’t know, I just do,” and that’s totally fine. But how do you know when you’re hungry and how do you know if you should be eating versus not eating if a tracking app isn’t tell you, “You have 500 calories left for the day,” how do you figure out what to eat if an app isn’t telling you what to eat? Amanda Tysowski: Well, I start the day and I have my water. And, when I feel like actual hunger or when the water doesn’t do it, that’s when I start to eat for the day. So, from there, I just kind of eat when I feel like eating throughout the day. Then, the thing about keto for me, is it’s the first time that I’ve ever been able to feel full in my life. I used to be able to eat and eat, and I wouldn’t have that full reflex. I could eat a plate of food, go back for more, and continue eating. With keto, I think it’s because of the fat, I know when to stop eating, because my body feels full. And, that’s something that I’ve never been able to experience before. I actually feel it’s quite empowering for me to not have that food maybe so much have such a power over me. Leanne Vogel: That’s awesome. So, because you’re so in tune with your body, and you’re pretty pro-eating intuitively, what made you decide to start tracking? Was it that everyone was just asking about your macros you mentioned perhaps on social media, and you wanted to give it a try? Or, what was that thought process like when you’re like “I’m going to track my macros and see what happens”? Amanda Tysowski: Yeah, it was exactly that. People keep asking me about it and if I’m going to give advice to someone, I think I should have some firsthand experience maybe. So, I thought I was far enough into this journey that I could probably maneuver the macros without them overwhelming me so much now that I have a better understanding of it. I thought with me going back to the gym, this would probably be a great time to start it. So, put the work in the kitchen, put the work in at the gym, as well, especially with the protein. I wasn’t sure that I was hitting that macro, so I thought yeah, I’m just going to give it a shot, and then maybe I can give some better advice to people who are asking for it from having a perspective from intuitive eating versus tracking. Leanne Vogel: Brilliant. Now that you’re on the other side of it and kind of just going back to more intuitive eating on keto, and that’s kind of been your experience while being keto, are there any specific support systems you’ve used to stay in that intuitive realm? Because, let’s be honest. The keto atmosphere is very much about macros and counting, and calculating. How do you stay true to yourself when there’s all that discussion everywhere? Is there a special place you go to? Or, anything that you can share with listeners? Amanda Tysowski: Yeah, I don’t think so. I just do what I want when I feel like it. I feel like that’s too easy of an answer, but that’s all I’ve done. Amanda Tysowski: If I want to go have a slice of cheese or I want to go have some bacon or veggies, or whatever, I go and I do it, and I eat it, and then if I’m full then I stop. Then, maybe later I won’t have as big of a meal. I just kind of listen to how I feel. Leanne Vogel: More of my interview with Amanda Tysowski after this message from one of our podcast partners. Was there anything that occurred in your life where you became a more intuitive person towards your body? It sounds like you have a lot of self-respect, self-care, and kindness. It’s not something that I hear of a lot, especially with women who have children, because they always put their family first, and the last thing they’re thinking is eating intuitively and taking care of their body. Do you have a self-care practice? Are you just naturally one of those people that is a very strong, independent woman that doesn’t take their bodies for granted? Amanda Tysowski: Well, I have taken my body for granted for a long time, and I think just this whole journey has been really empowering for me, and I’ve really found myself. It goes kind of hand in hand with turning 30 this year. My husband told me that I kind of had a little mid-life crisis. I’ve been just really treating myself this year and just going above and beyond to really put myself first now that my youngest is, he’s over one now and is not so needy of me. I’ve just really, really tried to enforce putting myself first and taking care of me so I can have more to give to them during the day, I guess. Amanda Tysowski: Well, this is going to sound crazy, but I started going to the gym at 6 a.m. last month and I never thought that I would say that I enjoy that. So, that for me, that I get up because my alarm clock told me to get up, not because my kid woke up really helps, and then that one hour of mental being away, like I do a class setting, so one hour of just mentally being able to shut down everything really helps do something for myself. So, if I go buy something or I started treating myself to a Starbucks or doing a face mask, or just something for myself. Like, when they’re in bed too, I just really try to put myself first. Or, me and my husband time. You know, just getting my life back, if that sounds … That sounds terrible, but I’m trying to take my life back. Leanne Vogel: It’s so true. Not even comparable, but we just got a puppy not too long ago and it’s been really challenging to care for her, and there have been weeks where I have not taken care of myself. And, I’m like, how do parents of humans do this? I’m having a hard time with a dog. So, I totally get that feeling of just needing time for yourself 100%. I’d like to shift gears just slightly and chat more about your ketogenic experience, because it’s very rare that we get to speak to somebody who is more of an intuitive person when it comes to their eating. What has been your experience, or have you had experience in … Initially, it sounds like you wanted to lose a bunch of weight with keto and you’ve had great success with that. Have you started looking at healing your body with keto? Have those two happened at the same time of weight loss and healing? Or, what’s been your experience if any with healing your body in keto? Amanda Tysowski: Well, I think that they’ve kind of gone hand in hand. I think the weight loss comes when your body is healing itself. I know your body’s not going to lose weight if there’s other things going on to an extent, I guess. I think also just reducing grains, not reducing, eliminating grains. My whole life I’ve had this rash that I’ve gotten and it comes on unexpected and no doctor has been able to tell me what it is, and I haven’t got it since I’ve started keto. So, I think there’s some things happening that coincide. The only difference in my life is that I’ve eliminated grains, sugars, refined foods, processed foods. So, I think that just eating foods that are clean, unprocessed, it all just works together and your body is just happy, and the weight just comes … Not just comes out, but it’s a pleasant side effect of it. Leanne Vogel: Mm-hmm (affirmative). That’s awesome. So happy for you. That’s just great. Do you keep track of the food that you eat with a food journal just to kind of see how food is interacting with your body, or do you not bother with that? Amanda Tysowski: I haven’t much in the past. It’s something I think I want to start doing. I think that I need to start eliminating dairy a little bit. So, I think I want to start journaling that a little bit more. Leanne Vogel: How do you know that you want to start removing dairy? What’s that all about? Amanda Tysowski: I’ve noticed I’ve had just a little obsession with halloumi cheese lately. I don’t readily have it, because there’s only one store near me that has it. Every time I go buy it, I’ve got some cystic acne that pops up on my face, and I’m kind of starting to put the two and two together. So, I think I will start journaling my food and tracking to see how the dairy does affect my body. Leanne Vogel: I hope it’s not the dairy, but it very well could be. Amanda Tysowski: I’ve suspected it for a while and this is, yeah, it’s sad. Leanne Vogel: Yeah, baby steps. Kevin, my husband, just started eating dairy again, and he hasn’t had dairy in years, since before we met. Well, he stopped eating dairy on our first date. I was like “I think you’re allergic to dairy, you keep clearing your throat.” He’s like “What’s dairy?” And, I explained it to him and he’s like “Oh yeah, I’m totally allergic to it.” Like, wow. But, he started eating it again and he’s been clearing his … There’s a lot phlegm in his throat, and he keeps clearing his throat. I’m like, “Babe, yeah. So, you’re eating cheese. But, you know. Live your truth.” He’ll figure it out and then he’ll be like “Oh, yeah.” So, baby steps. He can’t do it all. Okay. I want to chat with you about meal plans and just the hustle bustle of your daily life. How do you eat intuitively while also preparing meals and going to work, or not, or taking the kids to school or not, or all the activities that you have for your kids. How do you plan around that? Amanda Tysowski: That’s a good question. I’m not entirely sure myself. It is very very busy. Yeah, I don’t usually eat until I’ve picked my daughter up from preschool. So, that kind of works hand in hand. In the mornings, I generally just take out something for dinner. So, if I feel like today, I felt like I want to have taco salad for dinner, so I took out some beef, it’s thawing, and I’ll make it when my husband comes home. I basically eat two meals a day, and then I just snack if I need to in between. So, I have that meal after I pick up my daughter, and then we just have supper together as a family, as much as my children don’t think that they’re going to have a supper with us. Leanne Vogel: Amazing. What about food timing? When you started keto and were eating more intuitively, was there a time where you started just naturally fasting in intermittent fasting, or how does fasting work into your eating right now? Amanda Tysowski: Yeah, I’m not sure when I incorporated it. I think it was probably about two months in when I started intermittent fasting, when I started following people and starting to read up a little bit more on what fasting was, and intermittent fasting. But, eventually, I think as my body because fat adapted, I just naturally wasn’t hungry in the morning. If I remember correctly, I started eliminating breakfast and just having a Bulletproof coffee. And then, eventually, I pushed the Bulletproof coffee back and yeah, if I’m full, then I can’t be forcing my body to eat. So, it just kind of happened naturally, I think. Leanne Vogel: I think often times, probably the most common keto mistake I see is people start eating keto and three days in, they start forcing themselves to fast. And, I don’t know if you remember day three on keto, but I remember day three on keto, and it was probably the worst day. It was just the worst. You’re so hungry and you’re so tired, and you just don’t feel right, and all you want is carbs, at least I did. I was dreaming of sugar. I couldn’t stop thinking of it, so, that’s probably not the best time to start fasting. So, I really like that you said “Yeah, it just kind of happened,” and that’s how it should happen. It’s just one day. You go until 1 p.m. without eating, you’re like, “Wow! I guess I just fasted. Hey, welcome to intermittent fasting.” So, that’s cool that that was your experience, too. More on my interview with Amanda Tysowski after this message from one of our podcast partners. Support for this podcast comes from Broya. I know Canadians always get left out of special podcast offers, but I have one for you and it involves bone broth – real, wholesome, quality-made bone broth. I’ve searched high and low for a Canadian bone broth product that I could feel good about sharing and I’ve finally found it. Enter Broya, whose organic chicken and grass-fed beef bones are slowly cooked for 24 hours and made with ethically sourced, antibiotic-free, hormone-free, Canadian-based ingredients, and, total game-changer, their single serve bone broths are perfectly flavored with tumeric, salt, apple cider vinegar, and more. Plus they come in glass bottles, making Broya bone broth super easy to consume. You can go to BroyaLiving.com and use the coupon code KETO10, all in caps, no spaces, for 10% off. I have a question, kind of like a group of questions about food and how you know whether you’re hungry. We paneled our listeners and our private Facebook group, and they had some questions about how to know really when you’re hungry, and we kind of chatted about that initially, but how do you know if you need more protein or fat? What does that feel like? Can you put words to it? Amanda Tysowski: That’s a tough one. The protein, I’m not really sure how to feel that, because that’s something fairly new to me. I never really even bothered thinking about protein until I started going to the gym, but the fat, every time … If I look back, every time that I’ve been kind of in a stall, I’ve noticed that it’s when I haven’t been incorporating enough fat into my diet. So, I definitely can feel, but how do I know that I feel that way? I guess it’s just a reflection on the scale. If the scale is not moving for me, that’s kind of when I know that my fat intake hasn’t been adequate. Leanne Vogel: Okay. So, then, the scale’s not moving, you’re saying that one of your lessons that you’ve learned being keto is that you need to eat more fat? Leanne Vogel: Amazing. Are there any other lessons that you have that you’ve learned along the way that you’d love to share? Amanda Tysowski: I’d say I’ve really learned a lot about myself that I didn’t expect along this journey. I never knew that I was an intuitive eater. I didn’t know that I was in tune with my body. So, I didn’t actually know that until I started tracking. I didn’t put two and two together. That tracking month really enforced that I know what’s going on in my body, but yeah. Leanne Vogel: I would say for my experience, the way that I know that I need more fat is when I’m craving carbohydrates. Not necessarily, it’s not a really strong craving, but those will be the days where I’m like “I could have a carb up for lunch”, and then I’m like, what? No. That’s not a thing. Then, usually, that’s because I haven’t had enough fat. Or, for protein, I find that if it’s like a deep hunger and I’m not satisfied, even after I’ve eaten, I just feel snacky, that’s usually a good indication that I need more protein. So, yeah. Really great lessons learned and that’s taken me years to figure out. So, hopefully, that helps people listening, and you don’t have to struggle as much as we both have. I’m sure. Okay. Let’s chat about snacks. What are some of your favorite keto friendly snacks? Do you snack? Is that a thing for you? Amanda Tysowski: Oh, I definitely snack. Cheese has been a big snack for me, so I’m a little bit concerned about how I’m going to replace that. I love cucumbers. I could eat those by the gallon. Chia pudding is a big favorite right now. Sometimes, I’ll take those Whisps crackers, or cheese crackers, and I’ll have that with some salsa. We have a little salsa garden in our backyard when it’s nice outside here and we always make our own. Leanne Vogel: That sounds amazing. Oh my gosh. So good. And, what’s your favorite family friendly keto meal? You’ve chatted about a couple of things, but a meal that’s keto, that all of the people like in your family, what’s the go-to? Amanda Tysowski: Well, I can’t include my kids, because they don’t eat, no matter what I feed them. But, my husband, this week I made spaghetti squash Alfredo and he said he would pick that hands down any day over a regular or traditional Alfredo dish. Amanda Tysowski: That’s one of our go-to’s. Leanne Vogel: Where did you get the recipe? Amanda Tysowski: Probably Pinterest, a little bit of trial and error, but it’s so simple and it’s so satisfying, especially as we approach these cooler months, there’s so much keto comfort food out there, and I’m really excited to try out a bunch of new recipes coming up here. Leanne Vogel: Yeah, I agree with you. I’ve been digging soups and stews, and things. Even though where I am, it’s like really hot right now. I think it’s like 35 degrees Celsius, which is just really hot Fahrenheit. I don’t even know what that translates to. Probably like 90’s, but still. Even though it’s still winter and I’m still craving warmer things, even though it’s really hot outside, so I feel you on that. Okay. Let’s chat about your fullness factor, because we chatted a little bit about fat and you saying that when you’re on the scale, and it’s not budging, and you’ve hit a weight plateau, and you’ve increased your fat, how do you know if you’re eating too much fat? Has that happened to you where you eat too much fat, ever? Amanda Tysowski: I don’t think so. No, I don’t think I can recall any time that I’ve had too much fat. Leanne Vogel: Oh my gosh, really? Wow. That’s cool. I’ve overdone it a couple of times, yeah. I always say I’ll never do it again and then I do it again. I’m like, shoot. Then you feel … Well, it’s the worst feeling. I hope you never have to experience that. You just overdo it. Like super nauseous and beyond full. Not as bad as if you eat too much protein. I’ve done that before or eat too much food when you’ve been fasting for a long time and then you break a fast with a 3,000 calorie meal, and you’re like “Why did I do that?” It’s mostly nausea. When I was playing around with whether or not I could eat butter, and the answer is no, I can’t eat butter. But, when I was playing around with it, I ate an entire stick of butter with an entire batch of flax crackers in one sitting, and it was the worst feeling, ever. That was probably the only time I really overdid the fat. And, I was going to donate blood that day. I felt so bad after I donated blood that I was out for like four days. I guarantee you it was because I just had too much fat and then donated blood. It was this horrible mishmash of the wrong things. So, if anyone out there is going to donate blood, maybe don’t eat a stick of butter. I’d love to chat with you about carb ups and whether or not you practice carb ups. Do you practice carb ups? Amanda Tysowski: I have not. Not intentionally, anyways. I’m sure there’s some days where I’ve gone over on my carbs if I’ve had too much veggies or maybe keto friendly foods that sometimes I indulge in, but yeah. I haven’t purposely gone to do a carb up before. Leanne Vogel: Cool, okay. Awesome. I always like to ask. It’s interesting to hear different stories from people. Okay, so what do you feel is missing in the keto space for women right now? I like to ask that question of our keto experience people. Amanda Tysowski: That’s a great question. I don’t really know. I just kind of live on Instagram these days. So, I mean, there’s a great support system there that I don’t really feel that anything is really lacking for me. Leanne Vogel: So, your thing is really much support and making sure that you have the support. And, you feel like for women specifically, there’s a lot of support out there? Amanda Tysowski: Yeah. Well, in the Instagram community, for sure. It’s been game-changing for me. Leanne Vogel: Amazing. And, what’s your personal favorite keto thing to eat right now? We chatted about feeding your family and things like that, and your snacks. But, what’s the go-to thing that you can’t live without on keto? Amanda Tysowski: Oh, that’s a tough one. There’s so much good stuff out there. Right now, it’s probably chia pudding. I’m kind of obsessing over it. Leanne Vogel: Okay. What do you do to your chia pudding? How do you make it? Amanda Tysowski: I am so basic. I just use the coconut milk, some chia seeds, and I put a little bit of vanilla stevia drops in there, and that’s pretty much all I do with it. If we have in the house, which we don’t often now that it’s cooler, I really love raspberries in there. Yeah, now it’s kind of out of season, gone, which is sad. Leanne Vogel: Yeah, I totally understand. Raspberries are delicious. Cool, well, thanks so much for coming on the show today, Amanda. I really appreciate it. I think you really shed some really good words of wisdom when it comes to wanting to eat intuitively with keto, and just stand your ground, and really be confident in that. Thanks so much for coming on the show today. Amanda Tysowski: Thank you so much for having me. I was blown away and honored that I was asked and it was a really great experience. Leanne Vogel: Oh, awesome. Thank you so much, Amanda. And, I will see you around, probably on Instagram.